In November we commemorate the ninetieth anniversary of the end of the Great War. Even the smallest village still bears its scars when WWI wreaked havoc upon the male population in the first half of the twentieth century. Grey cenotaphs, lone stone soldiers with alphabetical lists of names of young men who left their homes never to return. Every 11th of November wreaths are left at the foot of the commemorative blocks of granite. It is a symbolic gesture. Out of respect to all those who gave their lives, not albeit willingly in some cases. Most people who experienced The Great War at first hand have passed away. Its ghost though still lingers in town square villages and seems to be forgotten and reduced to being just some dates in textbooks. 1914-1918. Great War venues, like the In Flanders Field museum, attract a lot of attention from visitors, veterans and other interested parties. Because the guns fell silent almost 90 years ago, every day since 1929 the Last Post has been blown at the Menin Gate. It is quite a moving ceremony and a very good moment to contemplate why millions of people died all those decades ago. Who cannot feel humbled by the remnants and stone witnesses to the human carnage, ultimate sacrifice and the things our ancestors had to endure, here in Flanders, where fighting was at its most fierce? Mr. Sassoon's poem still has the umph in it so long after it was first written. 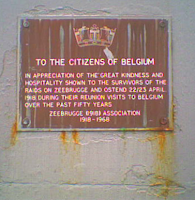 So how does Ostend treat its war memorials? It has a very impressive track record of destroying much of its heritage (but that will be discussed in another lengthy rant of mine). 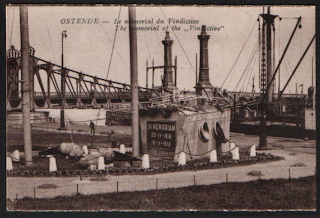 Today I'll talk about the Vindictive War Monument. In another post I will explain the significance of the monument and why it is not to be forgotten. A couple of weeks ago I wanted to visit again, but thanks to the town's Urban Planning Plan (if there is really such a thing) it was nearly Mission Impossible to get there. The road that used to run by it has been closed down. There is no parking space for disabled visitors. There was a big warning sign saying that access was limited to authorised personnel. Next to the sign there was a big padlock on the little hinged door that gives access to the stairs that lead you to the monument. Nothing, not even a padlock or some feeble warning sign can stop Mrs B, so before anyone could say disestablishmentarianism I was nearing the objective of my venture. Again, the site is inaccessible for people in wheelchairs. I was absolutely gutted by what I found there. The state the monument is in is appalling. No preservation whatsoever. Not even a lick of Hammerite could save them now. Everything is riddled with rust. Only the grass around it had been recently mown. 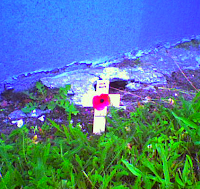 A solitary small wooden cross adorned with a poppy had been planted there by someone who still commemorates the men who gave their lives in order to save millions more. visits to Belgium over the past fifty years. Something must be done. The neglect is an outrage! There will of course be a renewed spark of interest in our WWI heritage in November and I hope it does cease there not fade away. Would you like it if ninety years from now people had forgotten the conflict in Korea or left the graveyards in Normandy unattended and those monuments were left to fend for themselves, moss growing on letters, bits of marble chipped off, garbage littering the site? It is even more saddening when you look at postcards from times gone by and compare them to the picture I took of the site and how it looks today. It is disrespectful. Ostend should be ashamed! Instead of trying to confirm their newly fangled status as theatre, film or fireworks festival city, they should instead turn their attention to less fleeting matters. And yes, war is not something to keep people visiting your town entertained, and it may attract only a handful of WWI history buffs, but it provides people like me with a moment to ponder about why we still have a need for education, practice politics and have an army. I shake my head in dismay, rant and rave on the internet and hope someone picks up my wails and screams bloody murder. 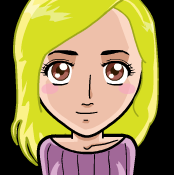 So this is what I look like in Manga. Except for the colour of the eyes. I was not able to change that. But a cool gadget on the web nonetheless. If you click the post title it will take you to the manga builder. We only have the pleasure we grant ourselves. A 30 ton transformer in the Large Hadron Collider malfunctioned. (Well there was a helium leak). That's what the news says. 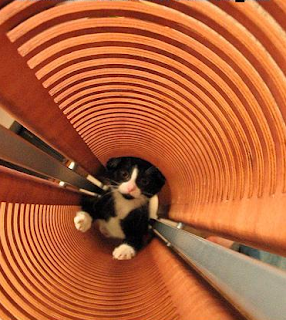 But I think it's just a kitty jamming the donut shaped particle accelerator. which elementary particle would you be? Well shiver me timbers! Interrrrrrnational Talk Like A Pirate Day tomorrow! I'm going to annoy the crap out of everyone at work tomorrow. Aye. To smash protons moving at 99.999999% of the speed of light into each other and so recreate conditions a fraction of a second after the big bang. Two beams of subatomic particles called 'hadrons' – either protons or lead ions – will travel in opposite directions inside the circular accelerator, gaining energy with every lap. Physicists will use the LHC to recreate the conditions just after the Big Bang, by colliding the two beams head-on at very high energy. Teams of physicists from around the world will analyse the particles created in the collisions using special detectors in a number of experiments dedicated to the LHC. There are many theories as to what will result from these collisions, but what's for sure is that a brave new world of physics will emerge from the new accelerator, as knowledge in particle physics goes on to describe the workings of the Universe. For decades, the Standard Model of particle physics has served physicists well as a means of understanding the fundamental laws of Nature, but it does not tell the whole story. Only experimental data using the higher energies reached by the LHC can push knowledge forward, challenging those who seek confirmation of established knowledge, and those who dare to dream beyond the paradigm. I'm so excited, I think I will hardly sleep tonight. The LHC will be online tomorrow! And if it doesn't churn out the data everyone is looking for: Let's just build a bigger one! There are only 24 hours in one day. And most of those I spend sleeping, eating, surfing, studying (or since July) training. So no extra time for working and blogging. And since I've been working no time for blogging. It looks like those two things cancel each other out. 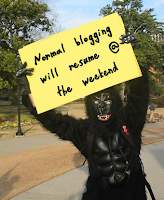 So I'm sorry I've been putting up messages that normal blogging will resume shortly. It seems now, it was a blatant lie. Yes, dear reader. I have been lying to you. But on the bright side: I will be putting up new stuff. I've been preparing a lot of posts but they are still in the rafters. So lots of gibberish to look forward to!